It’s official: this has been the most boring race for Christmas No. 1 in living memory. The X Factor winner is nowhere, the fan-led social media campaigns have failed to get off the ground, and Cliff Richard has other worries to contend with. Clean Bandit’s ‘Rockabye’ – already number one for over a month – looks as though it will claim the festive crown virtually unchallenged. Recently reduced to a trio, the group have been offered as clear a run towards pole position as can be imagined: the only challengers are Rag’n’Bone Man and Little Mix, whose single ‘Touch’ was released more than a month ago. The only fan-led campaign worth noting is thus far struggling to get off the ground. Rangers fans have taken to singing the name of Joe Garner when the tannoy plays Dave Clark Five’s ‘Glad All Over’, pushing the track into the lower regions of the Top 40. However the Official Chart Company state that the track has less than a third of the sales required to make the Top Five, and with just one day to go it looks as though the Ibrox faithful will fall somewhat short of their target. But it wasn’t always this way. Britain has a curious relation with the festive charts, an importance on the Christmas No. 1 that isn’t echoed in the United States, or even our European neighbours. A sizeable smash can essentially be used to build a career, with those iconic cuts being unfurled each year just as the tinsel comes down from the loft. 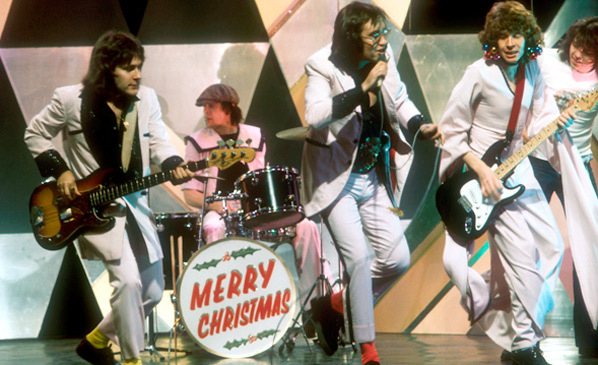 Slade songwriters Noddy Holder and Jim Lea make around £300,000 each from ‘Merry Xmas Everybody’, while The Pogues’ evergreen ‘Fairytale Of New York’ scoops just under half a million pounds. However it would be wrong to deify the Yuletime countdowns of yore – decades gone past offer up more than their fair share of exploitative tat. Mr. Blobby and Bob The Builder have both claimed Christmas No. 1 spots, while generations before that faced traumatising present-opening experiences to the soundtrack of St. Winifred’s Choir and Jimmy Osmond. The coming of the talent show seemed to change the entire rhythm of the pop machine. Recognising the importance of the festive sales bulge, Pop Idol (and then the X Factor) built their timeline around this, culminating in the high profile launch of a new act. Girls Aloud kicked off this pattern in 2002, and it grew so wearying that fans kicked off a counter campaign in 2009 in an attempt to stop Simon Cowell having his wicked way with their ear drums. In a memorable sideswipe Rage Against The Machine stole Christmas No. 1 away from The X Factor, with ‘Killing In The Name Of’ becoming one of the most riotous festive hits of all time. Yet this simply seemed to accelerate cynicism with the entire festive race. Social media campaigns were kicked off at the press of a button, eroding the link between the nation and the top spot. At the same time, the charts themselves seemed to drift out of sight. Where once the Top Of The Pops rundown providing a central debating point for families, it now exists only as a token Christmas gesture, featuring a handful of performances from the year’s biggest artists. Elsewhere, changes to the way music is released have led to alterations on the way the charts themselves are constructed. Downloading has been usurped by streaming, with Drake’s epic 16 week stand with ‘One Dance’ underlining how important digital is in the modern marketplace – but also how alienating it can be. The charts now come in on a Friday afternoon, meaning that they scarcely have the impact of the traditional Sunday night countdown. If the Christmas No. 1 lacks the lustre of old, then perhaps that’s because the charts themselves are no longer the central representation of the way we listen in a world dominated by iTunes, Shazam, and social media. But perhaps that’s being too negative. After all, the Christmas No. 1 is a unique tradition, and we’ve had plenty of non-festive hits before – everyone from East 17 to Whitney Houston and Robbie Williams have notched up Christmas hits without actually referencing the season itself. Maybe we need to tinker with the charts a little further. Maybe we need Cliff back. Or maybe the whole Christmas No. 1 tradition itself needs a little rest, a year off spent munching mince pies on the couch wondering how it can get out of doing the dishes.